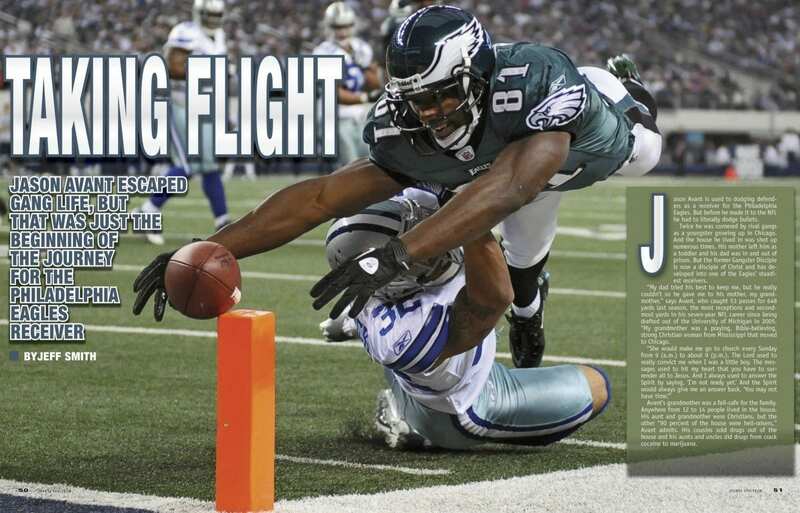 Jason Avant is used to dodging defenders as a receiver for the Philadelphia Eagles. But before he made it to the NFL he had to literally dodge bullets. Twice he was cornered by rival gangs as a youngster growing up in Chicago. And the house he lived in was shot up numerous times. His mother left him as a toddler and his dad was in and out of prison. But the former Gangster Disciple is now a disciple of Christ and has developed into one of the Eagles’ steadiest receivers. “My dad tried his best to keep me, but he really couldn’t so he gave me to his mother, my grandmother,” says Avant, who caught 53 passes for 648 yards last season, the most receptions and second-most yards in his seven-year NFL career since being drafted out of the University of Michigan in 2005. “My grandmother was a praying, Bible-believing, strong Christian woman from Mississippi that moved to Chicago. Avant’s grandmother was a fail-safe for the family. Anywhere from 12 to 14 people lived in the house. His aunt and grandmother were Christians, but the other “90 percent of the house were hell-raisers,” Avant admits. His cousins sold drugs out of the house and his aunts and uncles did drugs from crack cocaine to marijuana. By the time Avant reached the seventh and eighth grades he was going to school drunk and on marijuana. But there was one difference in his life—a praying grandmother. And soon, a change came. The house in Chicago was raided twice and before the state could confiscate the house with a third raid, Avant’s grandmother sold the house and the family dispersed. He moved to a new neighborhood and got away from his cousins, drugs and gangs. He got involved in basketball. But each time his dad tried to get involved in Jason’s life, his dad would end up in jail. By his sophomore year, Avant was playing basketball at Carver High School on the south side of Chicago. “My basketball coach, who was also the football coach, said, ‘Jason, you know you can’t play basketball for me unless you play football.’ I had never played football,” says the 6-foot, 212-pound receiver, who was recruited to play basketball for UCLA, TCU and Illinois. “He said, ‘No, really you can’t play basketball for me unless you play football. I need some football players.’ Nobody wanted to come out. As a junior he was moved to receiver and became the number one player in the state of Illinois. And with that came scholarship offers. Avant decided to attend Michigan, where he became a two-time Bilentnikoff Award candidate as the nation’s top receiver. During his senior season, he led the Big 10 in receptions (82) and was second in receiving yards (1,007). He finished his career at Michigan third in all-time receptions. “So just like the rest of my life because of my grandma’s prayers no matter where I would be—if I was on a bus or walking down the street—a missionary would always find me,” says Avant. “Anybody that was doing street evangelism would always find me. People would drive 20 miles just to take me to church. The pair started going to church for a couple of months. Then on May 4, 2003, Avant made a life-changing decision. “The preacher was preaching—I don’t even remember the sermon—but the Lord was dealing with me like when I was a little kid,” Avant says. “He began to replay in my mind all the times my house was shot up. He began to replay all the times I was in there about to get arrested and how He made a way for me. All the times I should have been killed in the streets because I was doing foolish things. Avant was baptized in water and came up with a new mind. He said that every thought he had went through a filter for Jesus Christ. As a result, he almost quit football, but his pastor in college said that the Lord could use him. Over the next two years he dug deeper into God’s Word and gained strength. Avant was drafted in the fourth round in 2006, and his reception total has increased in each of his seven years in the NFL, including 53 in 2012. Entering the 2013 season, he was averaging 12.5 yards per catch after piling up 3,199 yards on 259 catches and 10 touchdowns. 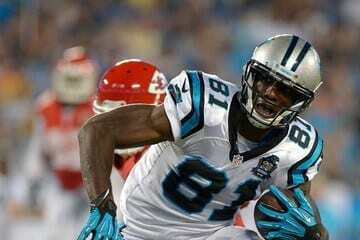 His steady play earned him a five-year contract extension in 2010. All of his first seven seasons came under Coach Andy Reid. Chip Kelly took over the reins this season, and Avant is expected to be a major player in the Eagles new offense. In his slot position, he takes a lot of hits coming across the middle, but 75 of his 87 career third-down catches are for first downs. Over time, Avant has become a role model to younger players and kids. In 2010, he was voted the Ed Block Courage Award by his teammates for the adversity he overcame as a young person. He also hosts a Christ First Football Camp every year, alternating between Chicago and Camden, N.J. Though having success in the NFL can lead to inflated egos, Avant has remained humble. Avant is keenly aware that it takes each member of the team to achieve a team goal and what he has to do to be a part of that success. “A team goal is a team goal,” Avant says. “It takes all guys. A lot of times it just takes mercy from God. Right things happen at the right time and you win the Super Bowl or something like that. Avant hasn’t forgotten where he came from and he realizes his role goes beyond the NFL. This story was published in the Vol. 27, No. 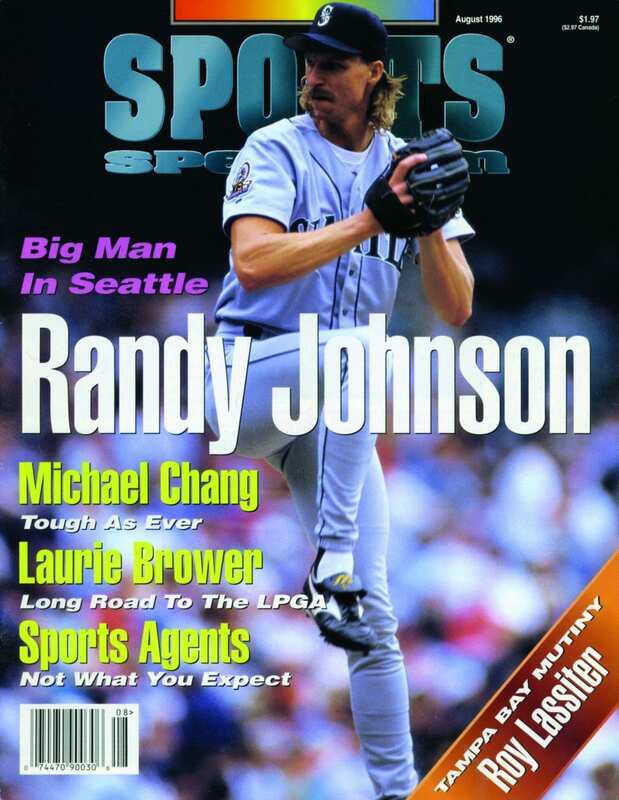 4 issues of Sports Spectrum. Jeff Smith is a freelance writer who lives in New Jersey.